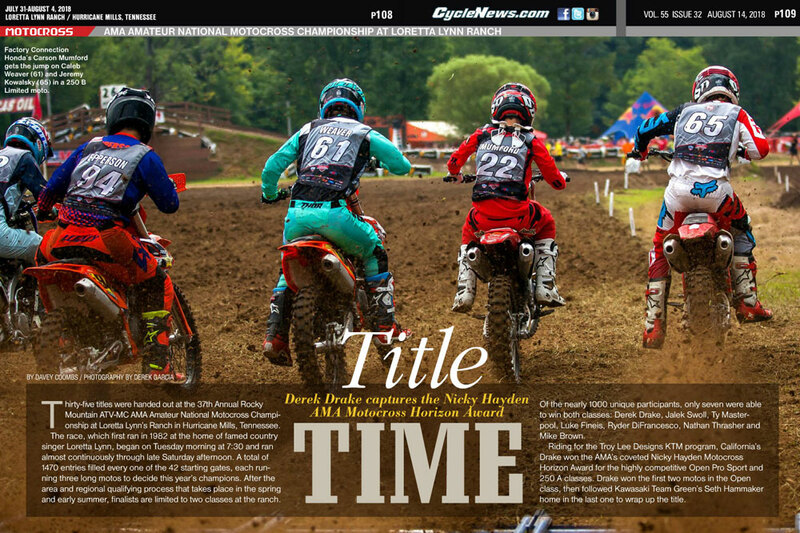 Loretta Lynn’s | Title Time! 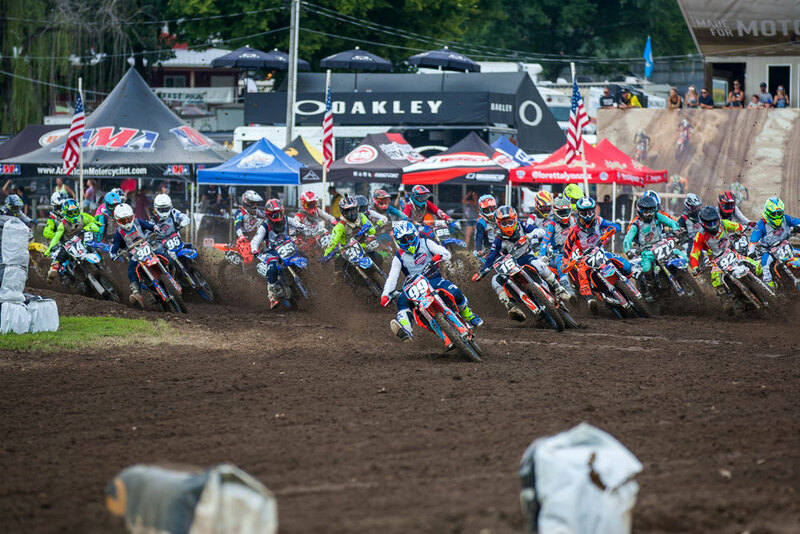 Thirty-five titles were handed out at the 37th Annual Rocky Mountain ATV/MC AMA Amateur National Motocross Championship at Loretta Lynn’s Ranch in Hurricane Mills, Tennessee. Factory Connection Honda’s Carson Mumford gets the jump on Caleb Weaver (61) and Jeremy Kowalsky (65) in a 250 B Limited moto. The race, which first ran in 1982 at the home of famed country singer Loretta Lynn, began on Tuesday morning at 7:30 and ran almost continuously through late Saturday afternoon. A total of 1470 entries filled every one of the 42 starting gates, each running three long motos to decide this year’s champions. After the area and regional qualifying process that takes place in the spring and early summer, finalists are limited to two classes at the ranch. Of the nearly 1000 unique participants, only seven were able to win both classes: Derek Drake, Jalek Swoll, Ty Masterpool, Luke Fineis, Ryder DiFrancesco, Nathan Thrasher, and Mike Brown. 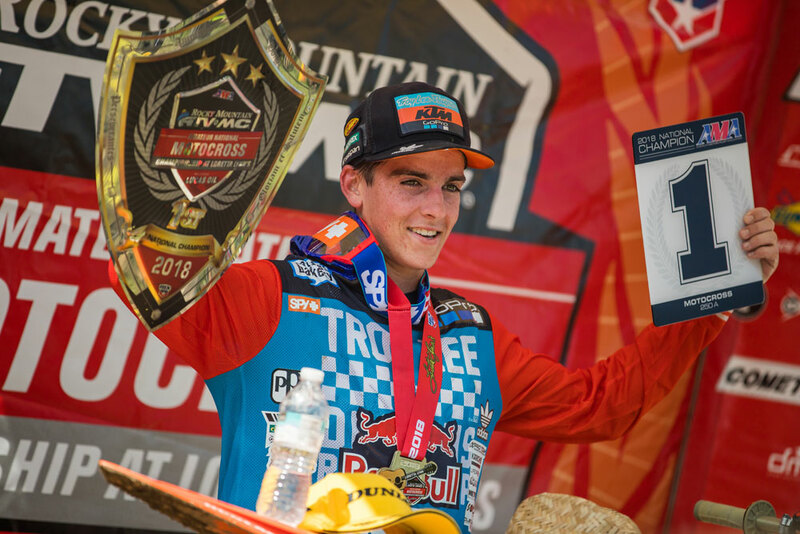 Riding for the Troy Lee Designs KTM program, California’s Drake won the AMA’s coveted Nicky Hayden Motocross Horizon Award for the highly competitive Open Pro Sport and 250 A classes. Drake won the first two motos in the Open class, then followed Kawasaki Team Green’s Seth Hammaker home in the last one to wrap up the title. Hammaker, who hails from Pennsylvania, suffered from poor starts the first two motos then used the far inside gate to finally get out front early in the last moto. His 2-3-1 scores were good for second overall. Drake’s win in the 250 A class was not so easy, as Yamaha-backed Tanner Stack of Kansas and Drake’s TLD KTM teammate Mitchell Falk (CA) joined Hammaker in battling with Drake. Hammaker won the first moto, Falk the second, with Drake runner-up and Stack third both times. It all came down to the final moto. Derek Drake earned the AMA’s Nicky Hayden Motocross Horizon Award with wins in the Open Pro Sport and 250 A classes. Jalek Swoll (30) and Pierce Brown battled all week long. Brown won three motos and set the fastest lap time of the week (one minute, 51 seconds) but Swoll took both class titles home with him to Florida. Rockstar Energy Husqvarna rider Jalek Swoll also had a great week, first graduating high school through Andrea Leib’s On Track School, then coincidentally winning the Schoolboy 2 (12-17) class as well as 250 B. Swoll went 2-1-2 in both classes to earn his titles, and both times he was followed by Utah’s Pierce Brown, yet another TLD KTM rider. Brown actually won more motos than Swoll but inconsistency kept him from a number-one plate. 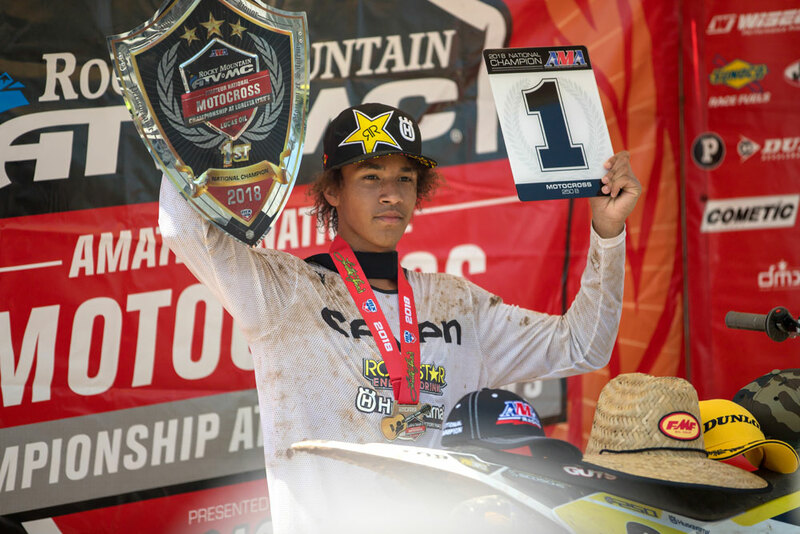 Brown, who hails from Utah, did steal the show in the final Schoolboy moto when he crashed just before the Ten Commandments whoops section and went to the back of the field. His frantic charge from there to overtake Swoll for the lead included the fastest lap time of the entire week, an eye-popping 1:51. But that number mirrored his 1-5-1 moto scores, the middle moto costing him in the final tally. Jalek Swoll was the AMA’s outstanding amateur competitor with two B class titles. Other B class standouts included Factory Connection Honda rider Carson Mumford of California, who won all three motos in 250 B Limited, and a pair of fast Texans on KTM’s in Cristian Fernandez, winner of the 450 B class, and Parker Mashburn, who topped 450 B Limited. And the College (18-24) title went to Connecticut’s Joseph Tait, who went 3-3-1. Star Racing Yamaha prospect Ty Masterpool won both of his 125 Schoolboy classes. 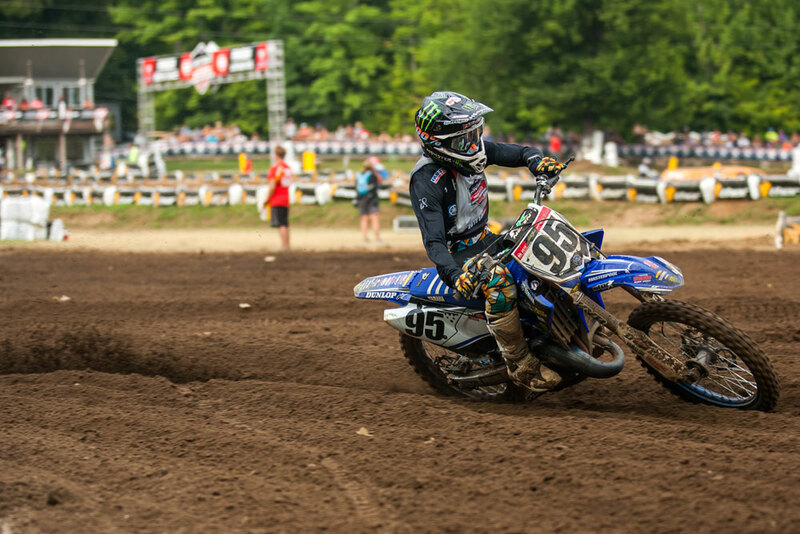 Monster Energy/Yamalube/Star Racing Yamaha rider Ty Masterpool racked up his fifth and sixth career titles at Loretta Lynn’s by winning both of his 125cc Schoolboy classes. Masterpool, who hails from Paradise, Texas, was challenged by a throng of riders from seemingly every corner of the country: Preston Kilroy (Wyoming), Aiden Tijero (California), Gage Linville (Georgia), Levi Kitchen (Washington), Cullin Park (Florida), Chandler Baker (Oklahoma), and Ethan Mann (Texas). Bad starts almost doomed Masterpool’s title bids in the first motos in either class, and he had to come from deep in the field to salvage a win and a runner-up finish. From there he gave up just one moto win to KTM rider Mann as he marched to his pair of titles. The most dominant rider of the week was Tennessee’s own Nate Thrasher. 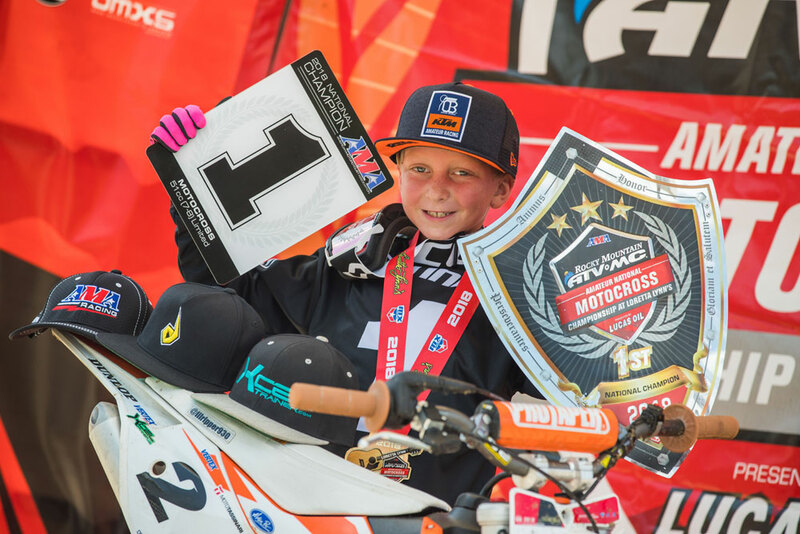 The KTM rider was the only undefeated rider of the week, winning all six of his Supermini motos and the first two national titles of his amateur career. 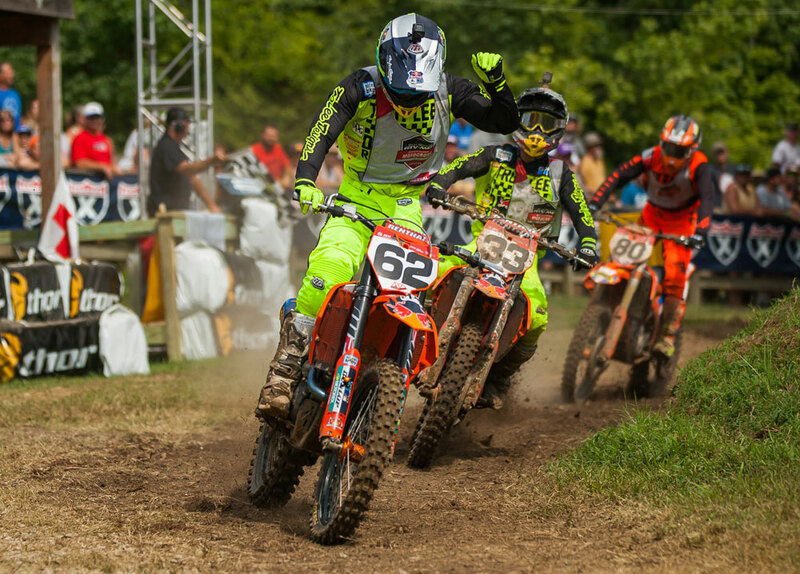 Tennessee’s own Nate Thrasher was the only rider to go undefeated and win all six motos on his way to both Supermini National titles. In Supermini 1 (12-15) Thrasher was followed in all three motos by California KTM rider Max Vohland (son of former AMA 125 Pro Motocross, AMA 125 Supercross and FIM Grand Prix winner Tallon Vohland) and fast Kansas kid Kaeden Amerine. Vohland followed Thrasher in all three Supermini 2 (13-16) motos as well, though third-place in this class went to Louisiana’s Matt LeBlanc. Florida’s Caden Braswell used 1-1-2 moto scores to take the Mini Sr. 2 (12-14) title from Oklahoma’s Jackson Craig, who posted 2-2-1 moto finishes. 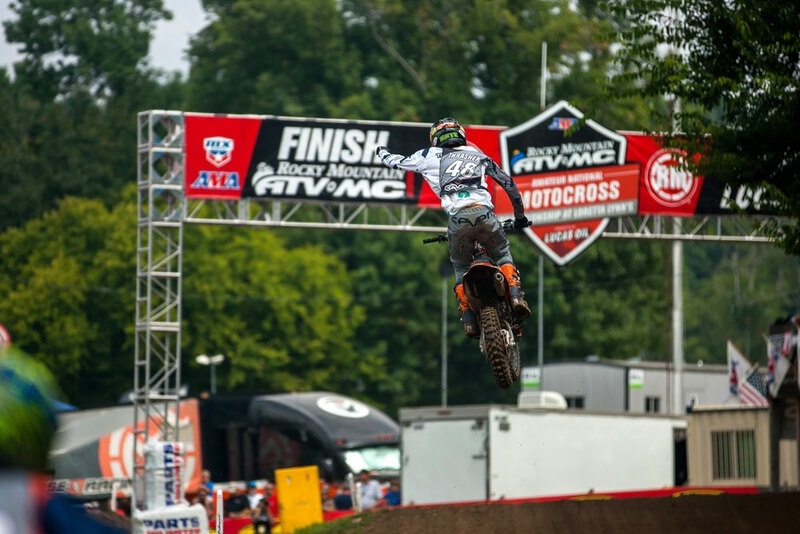 Indiana’s Luke Fineis won both of his 250 C classes and four of six total motos at Loretta Lynn’s. Kawasaki Team Green’s Ryder DiFrancesco continuing building his case to be ranked as one of the all-time fastest minicycle riders by adding two more titles to his career haul of six at Loretta Lynn’s, with several years to go. (Current Monster Energy/Pro Circuit Kawasaki rider Adam Cianciarulo has the most with 11 minicycle titles.) Ryder D. made it hard for himself in the first Mini Sr. 1 (12-13) moto when he crashed and struggled to reach seventh at the checkered flag. But then first-moto winner Myles Gilmore of Australia only made it up to 11th after his own mistake, and DiFrancesco was back in business with a moto win. The aforementioned Braswell won the last moto, but his 10th in the opener ruined his bid for another title. DiFrancesco ran second, which was enough to take the overall ahead of Washington’s Preston Boespflug (5-4-3). After a disappointing seventh place during his first moto of the week. 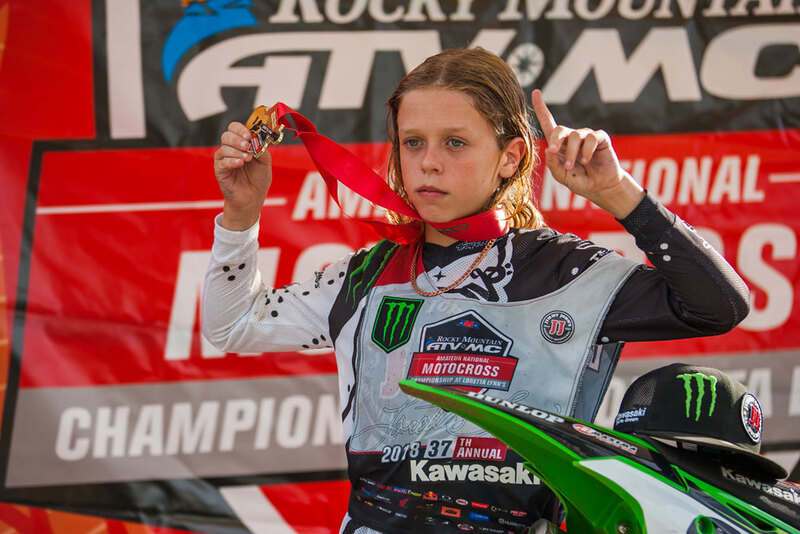 Ryder DiFrancesco came on strong to take two 85cc titles. The going was a bit easier in the 85cc (9-12) class for Ryder D. as he went 1-1-3 to top the 7-2-1 of Idaho Kawasaki rider Chance Hymas. 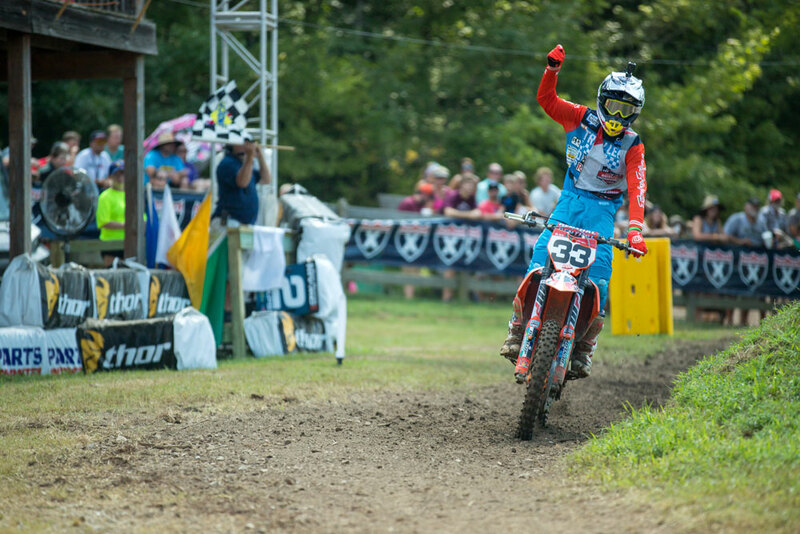 Third-place went to North Carolina KTM rider Daxton Bennick, who is building is building quite a resume for himself. Bennick won all three 85cc (9-11) motos to earn his third career title at the Ranch, bettering the 2-3-4 of Georgia Suzuki rider Casey Cochran. 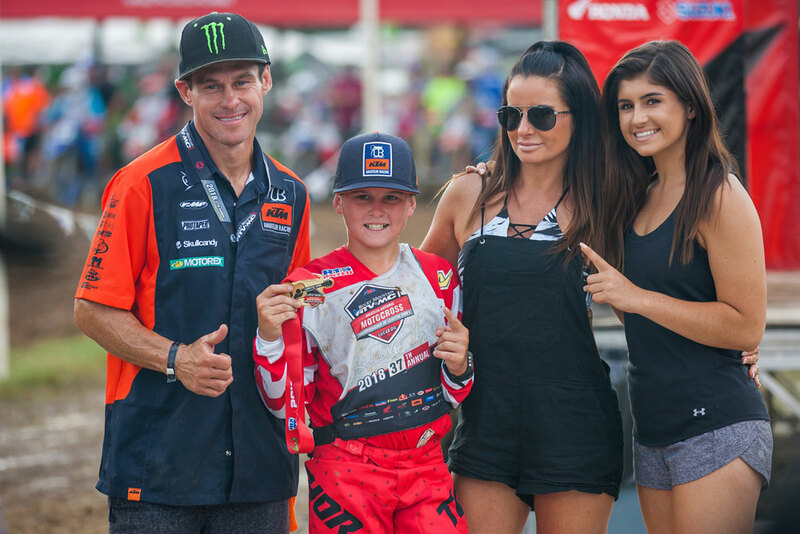 Hayden “Danger Boy” Deegan with parents Marissa and Brian Deegan, and his sister Hailie, who is currently in the NASCAR Development program in North Carolina. 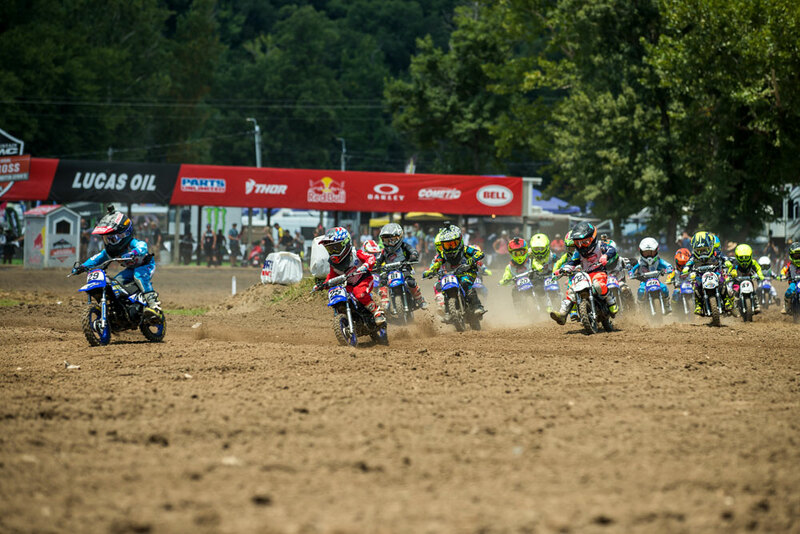 The 65cc (7-11) title went to Bennick’s North Carolina neighbor and friend Haiden “Dangerboy” Deegan, who swept all three titles. Deegan, a native of California, has been living and training in North Carolina while his big sister Hailee Deegan works her way up through the NASCAR system. She was there cheering her brother on for the title, as well as his 85cc (9-11) Limited motos, where he followed Bennick home the second and third time out but DNF’d the opening moto. The 65cc (10-11) overall win went to yet another Californian in Enzo Timmerman, who went 2-1-2 for the title. Finishing a historic second with 8-3-1 scores was Florida’s Logan Best, who gave Yamaha its first moto win on their recently revived YZ65. Finishing third was first-moto winner Landen Gordon, a Husqvarna rider from the Golden State. Brayton Kreglow takes the Bell Helmets $100 holeshot and goes on to claim the 51cc (4-6) Shaft Drive Limited National Championship. Cobra rider Drew Adams, another home-state rider who hails from Chattanooga, went 1-1-1 to keep the 65cc (7-9) Limited trophy in Tennessee. He was followed New Jersey’s Canyon Richards and Pennsylvania’s William Canaguier. The 51cc classes were won by California’s Seth Dennis (7-8 Limited) and Ryder Darrigo (4-6 Limited), Alabama’s Colt Martin (4-6 Special LTD) and Florida’s Brayton Kreglow (4-6 Shaft Drive LTD). Mitchell Falk celebrates after holding off his TLD KTM teammate Derek Drake in the second 250 A moto. At the other end of the age spectrum was 2001 AMA 125cc National Champion Mike Brown, now 46 years old. The Rockstar Husqvarna/FXR-backed Brown easily won the Senior (40+) class over the even-older Barry Carsten of New Jersey and Greg Pamart of Pennsylvania, but was even more impressive in the Junior 25+ class, where he won two of three motos from much younger competition. Only Florida’s Ricky Renner was able to stop Brown from having a perfect week, taking the second moto in this division. The two went into the final moto tied with 1-2/2-1 scores, and one of the best battles of the week ensued. Brown rode a wide bike out front, keeping Renner just behind him, sometimes even touching wheels. They kept it clean and close, and then on the last lap Renner made a slight mistake and Brown snuck away for his fourth title in two years. Brown won his first Loretta Lynn’s way back in 1988 in the 125 B Modified class! North Carolina’s Daxton Bennick won all three motos in 85cc (9-11) Limited. The Masters 50+ class wasn’t quite as clean. Michigan’s John Grewe and Suzuki-mounted Carsten, both participants in the very first Loretta Lynn’s back in 1982, battled tooth and nail in the first two motos, with Grewe getting the edge both times. But the third moto got testy when Carsten raced to the inside down along the front of the massive Loretta Lynn’s billboards, just as Grewe was going from inside to outside. Carsten yelled at Grewe just before the two collided, with Grewe going down and suffering a jammed thumb. He got up to finish second, enough for his sixth vet class title since 2014, but the effects of the thumb injury haunted him in the last Senior +40 moto, which he went into with 2-2 scores, then struggled to finish sixth. Grewe’s win and fourth-place finish marked his 42nd and 43rd starts at Loretta Lynn’s. The all-time record is held by Tallahassee, Florida’s Earl May, who’s 47th start came this year in the Masters +50 class, where he finished third behind Grewe and Carsten. 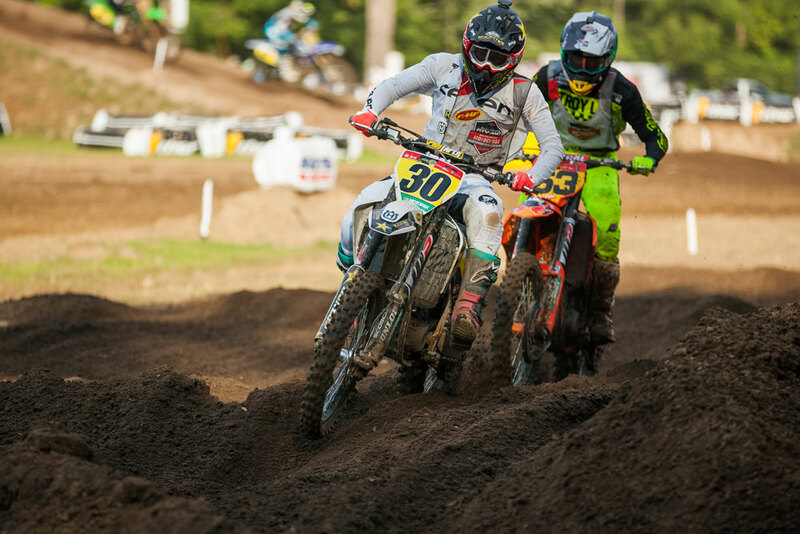 The Vet 30+ and Senior 45+ classes do not allow past pro riders with AMA Supercross/Pro Motocross points to enter, clearing the way for true sportsmen to challenge one another for titles. Florida’s Kenny Day took the 30+ class with 3-3-2 scores, as moto winners Darin Downs (TN), Chad Wages (MD), and Taylor Painter (TX) all suffered inconsistent scores. In the 45+ class California’s Terry Bostard went 1-1-4 for the title, dropping the last moto to overall runner-up Ed Ralston of North Carolina. Seth Dennis was the 51cc (7-8) Limited runner up last year. This time he grabbed the number 1 plate with 2-1-1 moto scores. 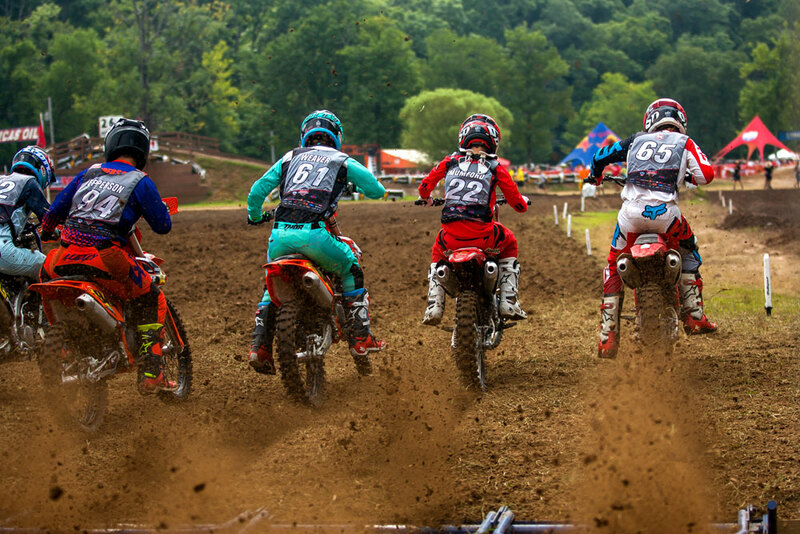 There were three Women’s classes at Loretta Lynn’s, including the Saturday-only WMX round. In the Women’s 12+ Amateur class North Carolina’s Jordan Jarvis was a perfect 1-1-1 to best Florida’s Jazzmyn Canfield, Utah’s Tayler Allred, and Maryland’s Katie Benson, who finished in that same order in all three motos. 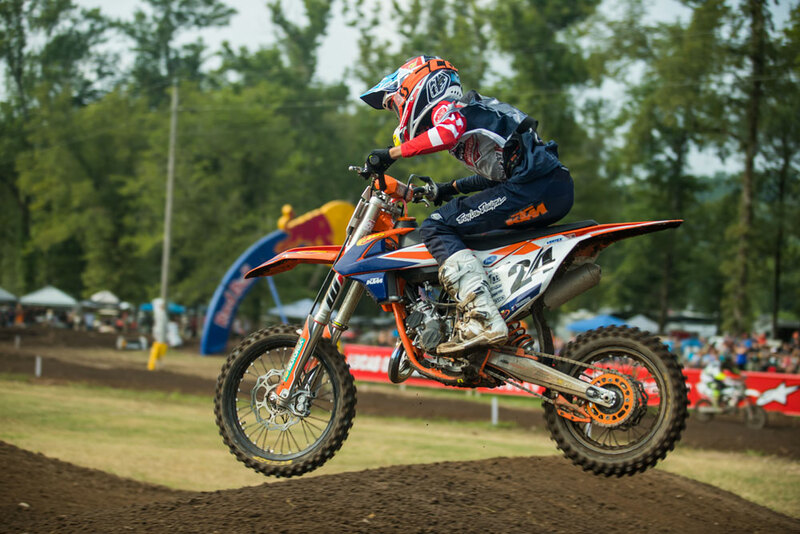 The KTM-backed Allred would get her own title in the Girls (11-16) group with 1-1-2 scores. Only the Yamaha-supported Canfield, overall runner-up here too, kept her from sweeping all three motos. And in the WMX race, where both motos were run on Saturday, Yamaha’s Jordan Jarvis took both motos from Florida Team Green rider Hannah Hodges and Tennessee Suzuki rider Shelby Rolen. 250 C rider Dustin Renteria of Hollister, California, had the most unlikely winning moto score with a 3-4-4. The KTM rider caught an early break when Hawaii’s David Dabin crashed back to a 24th in the first moto, then won the last two motos for seventh overall. Other C class winners include Canada’s Mikael Savard (450 C) and Indiana’s Luke Fineis, who won by 250 C Limited and 250 C Junior (12-17) Limited. Drake says he will most likely return and finish out his amateur career next year.